Although the organizer's list price is $20, with Amazon Prime I saved 30 percent. Could the cost of one Sunday brunch really give me back my utilities closet? According to the 5,365 reviews and 4.6-star rating, yes. But since I've never heard of the manufacturer, Home-It, I still did my homework and looked into its other products. My research was reassuring. Home-It's adjustable bed risershave 3,600 reviews and 4.6 stars, its velvet hangers have 2,000 reviews and 4.8 stars, its nail polish organizer has 4.7 stars and 2,500 reviews and its kitchen drawer divider has 4.7 stars and 1,600 reviews. "Can you wait until Dad is in town this weekend?" my Mom asked when I said I needed to mount something. Because I've never used a power tool, she had little faith. Fortunately, Dad's old drill in my garage wasn't too hard to figure out how to use. It's disappointing that this organizer — which comes with six screws and six plastic wall anchors — doesn't come with installation instructions. However, there is a picture of the finished product, right-side up, on the box, so it wasn't that hard. It was also easy to find a helpful article for mounting hardware online. Ten minutes later, with the help of a drill, screwdriver, pencil, level and hammer, the organizer was mounted and set in place. 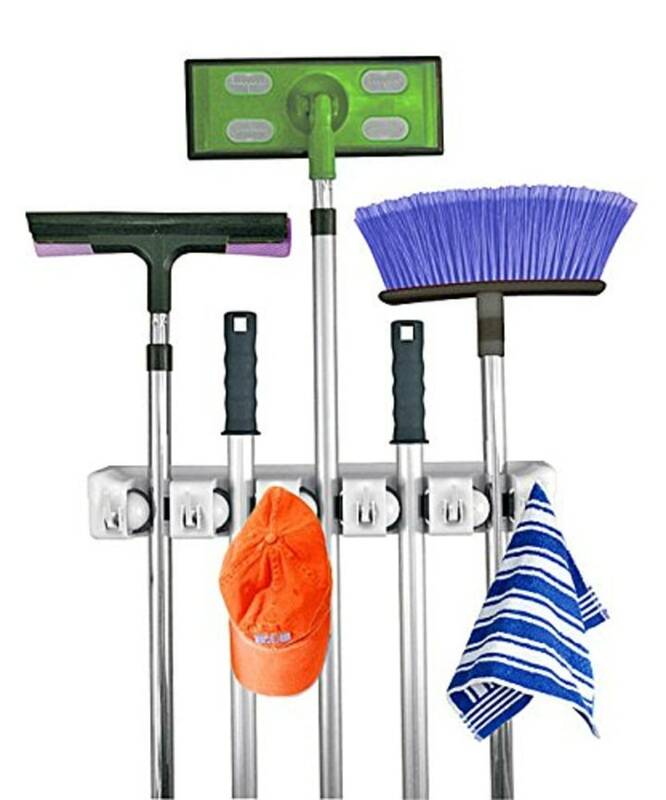 On my storage organizer, I hung a broom, a sponge mop, two Swiffers and a vacuum attachment. While some reviewers observed their items slipping as the balls lose grip, I've yet to notice it. In fact, the grip is so strong it often takes two hands to get a handle in and out of the slot. I look forward to showing my dad my handiwork when he's in town. In the meantime, I'll be binge-watching "Tidying Up." Perhaps I'll tackle organizing the kitchen next. If I can do a closet, surely I can do a cupboard.